This week brought much-needed snow to Colorado's parched Front Range. In one storm we received more precipitation than we had all winter long! 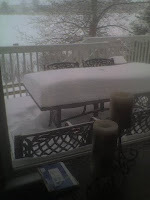 The total for our part of Boulder County: over 20 inches in 48 hours! Now it's melting and a bit of green grass is peeking out from the snow-covered lawn out front. It feels good to look out the back window and see the pond full and the stream that feeds it overflowing with run-off. As tech-savvy as we may be in the early 21st century, we still can't provide for our own precipitation. We're pretty dependent for that--on weather systems, at the least--or better, on God. A Bible verse which has come to mind repeatedly this week is from the Book of Isaiah: "For as the rain and the snow come down from heaven, and do not return there until they have watered the earth, making it bring forth and sprout, giving seed to the sower and bread to the eater, so shall my word be that goes out from my mouth; it shall not return to me empty, but it shall accomplish that which I purpose, and succeed in the thing for which I sent it" (55:10-11). At the end of the day, human beings (even we sophisticated ones!) are dependent on God's provision and gift of life--whether literally, though the gift of moisture to water the earth; or spiritually, through the sustenance of God's Word, the divine wisdom and way to life given through Scripture. God's wise creation of eco-systems, gentle and even fragile as they are, provides for our well-being. So too does God's Word, speaking into us life and refreshment, peace and hope, guidance and direction. Like the receptive earth beneath the snowpack, let us drink deeply and be thankful! Maybe it's because I'm firmly in mid-life now. Maybe it's because I serve as a pastor of a large church and am more in tune with reports of illness and death in the congregation. Maybe I'm just more sensitive to it all now. I'm not sure. But all that seems to strike me of late is the frailty of our human flesh. Positive diagnoses for cancer have abounded recently; life seems to be flying by (my wife has now known me longer than I was alive when I first met her!). My 30th anniversary of my high school graduation is only two years away. My oldest son is my size and he's only 14. Wherever I turn there are reminders of time passing by, the body aging, life moving along--and the frailty of our mortal flesh. Heck, even the indomitable Lance Armstrong just had a major crash racing in Spain and will be off the bike with broken bones for the next six weeks or so. I'll bet that being 37 will make it harder for him to recover. Aging does that. So what does one do with the inevitable onslaught of mortality? Some would say "eat and drink for tomorrow we die" (that's a biblical quote, by the way, but of the pagan world at the time of the early Church). Others might throw themselves into their work or family or other activities to either attempt to leave their mark or simply to distract themselves from the inevitable. As for me, I want to realistically face my mortality and acknowledge that this is indeed the human condition. And as I affirm these things, I'm aware...that we are in Lent. Lent, the season of the church year where on Ash Wednesday we mark worshipers with ash in the shape of the cross and intone over them, "You are dust and to dust you shall return." Mortality. Frail flesh. Very clear! And then we add something extremely important: "But thanks be to God for the resurrection of Jesus Christ!" So let's go back to that pagan quote from the Bible. It's preceded by the apostle Paul's very important condition. Hear it again in its entirety: "If the dead are not raised, 'Let us eat and drink for tomorrow we die'" (1Corinthians 15:32). With Paul and the early Christians and, indeed, with biblical Christians everywhere who affirm that Christ is risen from the dead, I choose to celebrate the resurrection amidst the mortality of my flesh. Yes, I'm aging and I will die--and so are you and so will you who read this. "But thanks be to God for the resurrection of Jesus Christ." Lent leads us to Easter. We know how the story will end--and it ends very well indeed.